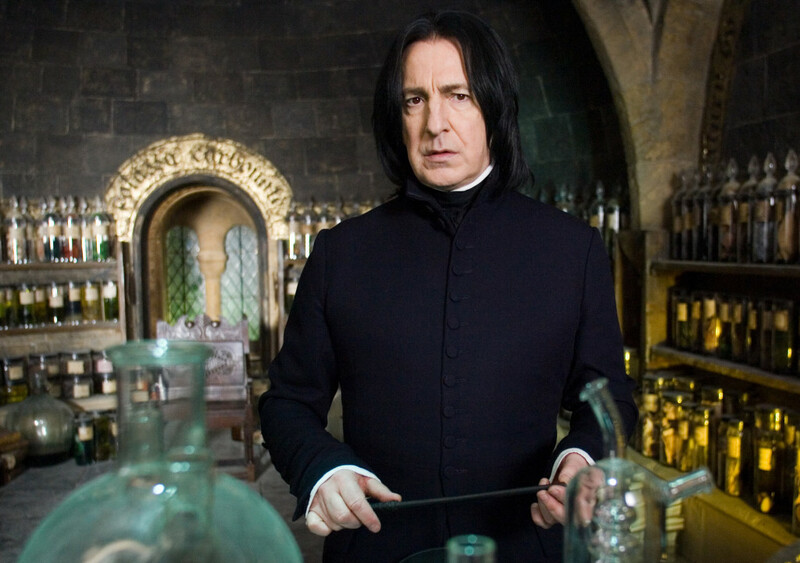 Professor Snape is the bad guy, who turns out to have an actual heart. He's tough, smart and frustrated. He knows all about the dark arts, but is he really evil? Without spoiling it, let's say he has depth. But he does cause quite a lot of damage. Anyhow, I think he's certainly dark enough to merit a Halloween dress up. Like his character, Severus Snape's outfit is of course very dark. In the movies the color is generally a very dark blue or black. Are you wanting to dress like Professor Snape for Halloween? The popular anti-hero of the Harry Potter books and movies is a fun costume to put together. I think we all sort of love to hate Professor Severus Snape, don't we? Most of us can remember a teacher in school who was difficult to please, judgmental and often close to being despised. As I am sure you know the professor teaches potions at Hogwarts for the most part. Well, that and generally causing some problems within the school for Harry and his friends. Let's see if we can find all of the pieces to create a Professor Snape Halloween costume. This wig only needs a bit of trimming to become the perfect Severus Snape wig. And let's face it, it's supposed to be unkept, so you could just stick with the wig as it comes out of the box. 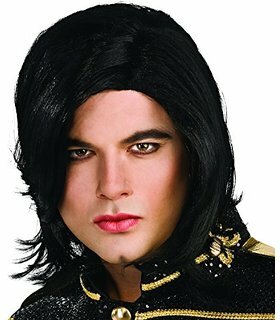 This wig is not exactly like Severus Snape's hair but it is difficult to find one that looks exactly like his style. This one is close enough. Parted down the middle like Professor Snape wore his hair and is in a longer length for men's hair. I think this wig would at least give the illusion of our Hogwarts professor for a costume, anyway. You can't be Professor Snape without the coat, now can you? The coat of Professor Snape is unique in its style so just any old black coat will not do. This coat with a cravat is very realistic to the film. Even the buttons of the Snape coat are covered in fabric like we saw in all of the Harry Potter movies. 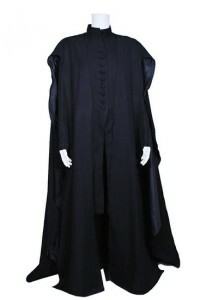 Fashioned after the very robe that we saw Professor Snape wear in the Harry Potter movies, this robe is very authentic. From the devil tongue style train in the back to the pleated shoulders and back this is the perfect robe for a Professor Snape costume. Really, any black pants will do for a Professor Snape outfit: after all, in the book his outfit is a result of being generally badly dressed and groomed. Still, these are the originals from the movie. The fabric matches the coat and includes the decorative buttons at the ankles just like Severus wore. It's not often that Snape wears a wizard's hat in the movie, however in the book he does. He has to wear one occasionally though - however ridiculous it would look with that hair... But isn't that the whole point of a Severus Snape Costume? Of course you will need a wand for your Professor Snape costume. This one is made of resin and measures slightly over 14 inches. Made to realistically represent Snape's wand and is perfect for your costume. You can't be a wizard without a wand now, can you? The wand of Severus Snape is of birch wood and an unknown core material. Severus Snape wore black shoes which shouldn't be surprising because he was always dressed in black. His shoes or possibly they were boots had a pointed toe for the most part so if you want to go as realistic as possible with your costume then dress shoes with a pointed toe will give you the best result. Black ankle boots with a pointed toe would also work. Do you think Severus Snape is scary enough to be YOU for Halloween? 27% Haven't you heard? Snape is one of the good guys now! 25% Good or bad, Snape is scary! 23% You don't have to be scary on halloween, it's a myth! 333 people voted in this poll.